Terry Duffelen looks forward to another round of fixtures in the German second division. Hertha surprisingly only managed a draw against bottom club MSV Duisberg last Monday but are much more reliable at home in Berlin. In fact they’ve only dropped points at home once so far this season. Despite being undefeated, 1860 have only won once away from the Allianz so a draw may be a reasonable bet. Definitely a game for the much talked about football hipsters. St Pauli welcome their new coach Michael Frontzeck for his first match in charge after André Schubert was sacked. As Jon Hartley pointed out earlier this week, the former ‘Gladbach coach’s win percentage of is not great and it is difficult for the outsider to see the logic in the appointment. Union are recovering from a pretty awful start to the season. Six of their last seven points have been at home with only two points so far on the road. There may be a volatile atmosphere at the Millerntor which Union may be able to take advantage of. While an away win may seem optimistic I would not be surprised to see the away team score the first goal of the game. The other Frankfurt have dropped to seventh in the table after two consecutive defeats. Paderborn are not quite the team that has challenged for promotion in recent seasons and they too have lost their last two games. Well, they can’t both lose. In fairness to Paderborn their last two matches were against a resurgent Cologne and high flying Cottbus. They’re not so good away from home however, so a Frankfurt win seems the most likely outcome. Bochum’s travel to the Eintracht Stadium in reasonable form. Just the one defeat in five for the club from the Ruhr and that was against a very good Kaiserslautern side. Having said that their last win was five games ago albeit away from home. Braunschweig are still top and still unbeaten, only dropping points against ‘Lautern and 1860 Munich which is no disgrace. Home win. Along with Braunschweig, Cottbus are perhaps a surprise early season pace setter. Their first set back came last week at the hands of Union Berlin. What better time to play the bottom club than when you need to put things back on track? A word of caution before you lump your lunch money on a home win. Duisberg managed a draw against Hertha last week and while should not be regarded as in a false position, are dogged opponents. Whenever the home side have picked up points it’s been against manageable opposition but as soon as they encountered 1860, they lost. On Sunday they face another promotion contender in the improving Kaiserslautern who I think are the best team I’ve seen in this division. Admittedly, those are dangerous words in what is a very fluid and unpredictable league. However, FCK have won all of their away matches and it would be a surprise if they didn’t leave the Audi Sportpark with at least a point. Interstingly ‘Lautern have always been the first to score in their games on the road. Two straight wins has moved Regensburg into a reassuring mid table position and should be confident of win number three against a plummeting Aue side who have not once since August. Five wins for Aalen this season, three of which have been away from home. Sandhausen meanwhile have been wretched just about everywhere with only one point in five. It was panic stations a few weeks ago as Cologne sat second from bottom of the table with barely a point to their name. Two wins later and the mass ranks at the Rheinenergiestadion are starting to breath again as is the coach, Holger Stanislawski. Dresden’s win against Aue was their first for four games. Very difficult to foresee the outcome but your suspect that the home side’s squad is starting to click which should give them the edge. In truth, there are many websites and blogs about that would present a more thorough and likely informative preview of the league, delving specifically into each club’s strengths and weaknesses. My guess is by the time this is posted, Jon & Terry will have done that very thing in a podcast format, so I’m at a distinct disadvantage. The other excellent contributors to this site would also be much more qualified to present an overall primer for the upcoming 2011/12 Bundesliga season. So why have I done so instead, risking general scorn and derision with something that is certain to be far off the mark? Well, the computers were down at my office, and I was bored. So, let’s begin with last season’s top clubs and proceed forward. 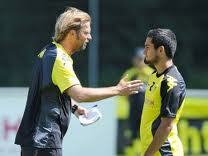 The electrifying display by BvB last season led to a league title for Jürgen Klopp’s lads that no one saw coming. With Nuri Sahin guiding the attack from the midfield, Shinji Kagawa and Mario Götze flashing across the goal, Großkreutz, Lewandowski, or Kuba bombing down the flanks, along with exemplary defensive work by central defenders Subotic & Hummels, Dortmund withstood a slight sag in their final form to take the Hubcap for the first time since 2002. One of the keys to that campaign–along with breathtaking offensive play & solid defensive work–was home form. Westfalenstadion was treated as a virtual fortress by BvB, with only 1 loss at home all campaign–the opening fixture to Bayer Leverkusen. Might they have the chance to repeat? The Special One swooped for Sahin but Klopp reloaded with former 1.FC Nürnberg midfielder Silky Ilkay Gündogan taking Sahin’s spot alongside solid defensive midfielder Sven Bender. Silky’s a promising young player and should fit in nicely with the squad built by Klopp–which remained mostly intact–but he is not as similar player as Sahin when it comes to playmaking. Gündogan can, at times, get bogged down in a midfield that Sahin would glide through more easily because his vision is considerably developed for a player his age. Further, Silky’s not as proficient at dropping back to help out a fullback or CB in distress, as Nuri demonstrated with aplomb last season. Finally, Sahin’s passing skills are remarkable–again, that vision thing–and anyone who would have been brought in to replace him would simply not be able to provide the same level of quality to Dortmund’s dazzling 2010/11 form. Kidding. Supremely kidding. Die Werkself have a good bit of work to do if they wish to stay in the upper tier of the top flight. Jupp Heynckes has gone back to manage Bayern Munich, Sami Hyypiä retired, Arturo Vidal’s gone south to Juventus, and Stefan Kießling is still, well, Stefan Kießling. Think of him as Peter Crouch sans Robot Dance and with slightly better accuracy with his noggin. And while the club did attempt to replace the fabulous Finn with talented young defender Ömer Toprak from SC Freiburg, nothing has been done to shore up the fullback positions, notably at RB. Bayer 04 has already been knocked out of the German Cup in the first round by newly promoted 2.Bundesliga club Dynamo Dresden by a score of 4-3. In case you hadn’t heard, Leverkusen lost that affair despite Dresden spotting them a 3 goal lead. The comeback came about largely because of mistakes made from RB Hanno Balitsch along with GK David Yelldell. That’s right, David Yelldell has been deputized as Bayer’s No. 1 in Rene Adler’s absence, and he had a rather difficult time between the sticks in Leverkusen’s first competitive match of the season. So, at the beginning of this campaign Werkself have two glaring weaknesses that most of Bundesliga and whomever they face in the Champions League group stage will tear apart should continued defensive issues not be addressed prior to the end of the close season or if Adler’s recovery time is more extensive that initially believed. It won’t matter how many goals offensively-gifted newcomer Andre Schürrle or that little sparkplug, Sidney Sam, can score from the flanks if Leverkusen’s fullbacks consistently find themselves pinched in and leave Toprak, Stefan Reinartz, or Manuel Friedrich at the mercy of Bundesliga’s top wing players with less than reliable hands behind them. As for new manager Robin Dutt, well, we’ll see. He performed minor miracles over the years for a small SC Freiburg side that had spent most of its history in the 2nd division rather than in the top flight as it does today. And, given time, Dutt should be able to impress at Leverkusen, but likely not this year. This is truly his first “big” job managing in German football, so being slightly unproven at a top club with the additional headaches of Champions League group play ahead, there are enough doubts about Dutt to suggest there will probably be a slight downward adjustment to Bayer Leverkusen’s aspirations this campaign. Qualifying for a Europa League spot would be a successful season, methinks. Wait, a manager taking the reins of his first big-time football club, a slightly dodgy US keeper who’s replaced a very good keeper that sometimes makes brilliant saves yet makes a hash of easy ones, problems at RB, likely finishing between 5th & 7th, and a lanky centre forward with slight accuracy problems? Bloody hell–I support the Tottenham Hotspur of Germany. Here are your favorites to reclaim the Hubcap this season. The Bavarian braintrust was slightly perturbed at Louis van Gaal’s handling last season, so they brought back a trusted old hand in Jupp to be a bit of a caretaker for a club that’s brimming with enough quality to truly dominate the league and make a deep run in the Champions League. If you recall, this year’s CL Final takes place at Bayern’s stadium, and die Roten want to be at the Allianz as participants rather than simply hosts. It has already been a decade since FC Hollywood last won that jug-eared cup, and Nerlinger, Hoeneß, and Rummenigge want it back, regardless of cost. Which of course, brings us to Bayern’s biggest transfer activities of the summer. While they were unable to get their hands on Vidal–Rudi Völler flat out refused to sell the Chilean to Bayern regardless of price–the Bavarians splashed out over €19 million to bring in Germany’s No.1 GK Manuel Neuer, and shelled out nearly €12 million to return Jerome Boateng to the land of his birth after his ill-fated Manchester excursion. Along with other transfers, including an intriguing ones that brought former Gamba Osaka MF Takashi Usami in for less than €300 thousand, Bayern Munich have already spent 1/3 of the total transfer purchases debited to Bundesliga clubs this summer. The cash is flashing, and it’s not yet done, as there are rumors about regarding a possible move for Chelsea’s defender Alex. Does money buy you a title? Not necessarily, but when you’re Bayern Munich, it probably does. 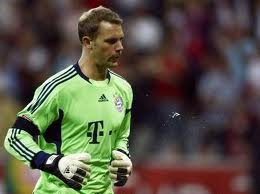 The club still has a depth of talent littered about the midfield along with solidly reliable wee captain Lahm, so for them, they probably could score enough goals to win after forking over a lot of euros to Schalke 04 for the best keeper in the league to stop all he sees. Some things never change, though, as Arjen Robben and Franck Ribéry have already picked up early injuries from action in pre-season friendlies, so the winged duo might be slowed at the start of the season. Honestly, it should be down in the standard manager’s manual to bubble-wrap those two and not unwrap them only when league play starts. One of the biggest reasons for believing Bayern Munich will likely finish as league champions this season, though, is because the other pretenders to the throne seem to have been weakened by the summer transfer season. Dortmund and Leverkusen have already been mentioned, and other potential upper tier clubs like Hamburg and Schalke 04 have not appeared to have strengthened enough to truly challenge just yet. Until Wolfsburg sort out Diego and Felix Magath finds a way to re-educate young Simon Kjaer on how to play defense, die Wölfe are likely too far out. Bruno Labbadia will likely reach his expiration date with VfB Stuttgart, derailing that club’s chances at the top, and Hannover 96 will remain quietly just hanging around, much as they did last year. As for Mainz 05, in addition to losing Schürrle and Lewis Holtby in the off season, they will be competing in Europa League after last year’s fantastic campaign. Much like BvB last year, Thomas Tuchel had nothing but the league to focus on, so it would be difficult to imagine the Carnival Club being back amongst the leaders this season while trying to balance a smallish squad with the rigors of an additional cup competition. Any finish somewhere mid-table in front of the supporters at their spanking new Colface Arena should be considered a success. Outside of 1.FC Köln–which might surprise under new manager Ståle Solbakken–my pick for a club poised to make a run this season is 1899 Hoffenheim. Long-serving FC St. Pauli manager Holger Stanislawski was named the new boss at the Sinsheim club prior to the end of last season, and for some reason I think his arrival might finally kick 1899 out of its mid-level funk and seriously push further up the table this campaign. For some unknown reason, something tells me Stanis will find a way to get the best out of Icelandic heartthrob Gylfi Sigurðsson and sort out Ryan Babel to become a somewhat reliable scorer. Look for Germany’s richest village club to be more dynamic this campaign and be nearer the European spots near season’s end than perhaps you might imagine. Just try to ignore the fact they still have Edson Braafheid in the squad. As for the rest? If SC Freiburg lose Papiss Demba Cissé by the end of the month–and considering they already signed Garra Dembele earlier anticipating his departure, it’s expected to happen–the Breisgau-Brasilianers are possibly headed for a return to 2.Bundesliga. Remember, no Robin Dutt anymore. Newly promoted club FC Augsburg will likely be joining them, as the step up to the top flight will be too much for a club that has spent most of its history hovering about the third division. 1.FC Nürnberg might find themselves in the 16th position as they did a couple seasons ago, but most probably would win a relegation playoff–again, as it did a couple seasons ago. The other clubs finish somewhere in between, but accurately predicting where is like getting me to appreciate Mario Gomez. There you have it–a far too long preview for the 2011/12 Bundesliga season that had virtually no worth. If you read down this far, congrats. You either actually care about German football, don’t mind being slightly insulted, or your computer systems were down at work like mine.